It's early December and Boulder is just now getting its first real snowfall. The dry, fluffy white powder is falling here in town, meanwhile the mountain resorts are reporting new records. In Vail, the cumulative year-to-date snowfall is now 141.25 inches. This exceeds the 85/86 season record of 140 inches. Almost 4 feet of snow fell on Vail over the past week alone. Let it snow, let it snow, let it snow! By the way, for those of you who still think that the weather here in Boulder is something out of the Shining, let me dispel a myth. Yes, we do get dramatic amounts of powdery snow here in Boulder, Colorado. But soon after it's sunny again (nearly 300 days of sunshine a year) and the snow melts very quickly. 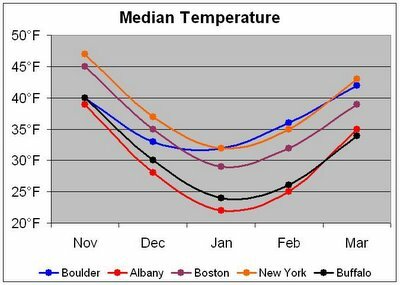 It's not at all like the bitter cold winters in many parts of the Northeast where it's gray and icy for weeks. Just for fun, I did a little analysis for you. 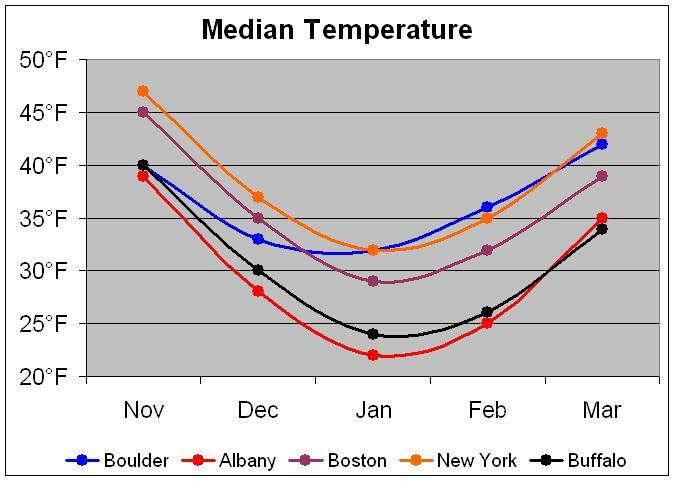 Choosing cities where I have friends and family, I used data from the Weather Channel to plot median temperatures across the winter months. Boulder compares quite favorably in my opinion. Take a look at the chart below.